We believe the designers, artists, scientists, programmers and creators are the unsung heroes behind brands that make magic happen in our lives. The brands are the seal of these creators’ souls: they symbolize their blood, sweat and tears. We believe that we should cherish brands and its creators, protect them, encourage them to keep going and strengthen the connection between people and brands. The Seal app allows anyone to check if a Seal-enabled product is genuine. A simple tap with your smartphone lets you scan the Seal NFC chip, which is embedded in products, and shows you information about the product. The Seal chip, Seal app and the Seal Network provide authenticity and other services for products and brands. We use dynamic NFC chips instead of static QR-codes and RFID for better security and copy protection of the chips itself. By facilitating a secure tokenized version of a physical product, Seal allows product-specific services to operate such as transferring ownership, theft prevention, insurance, but also brand activation campaigns and product analytics. For the first time in history, brands can earn money from items sold through the secondhand trade, while simultaneously protecting their markets from counterfeiters, by leveraging blockchain technology. We believe that the designers, artists, scientists, programmers and creators are the unsung heroes behind brands that make magic happen in our lives. The brands are the seal of these creators’ souls: they symbolize their blood, sweat and tears. Together they turn ideas into reality, transform things into culture and bring us confidence, laughter and joy in our lives. Therefore, we believe that we should cherish brands and its creators, protect them, encourage them to keep going and strengthen the connection between people and brands. We want to pave the way to a genuine and enriching world, without fakes or soulless products and their devastating consequences. We aspire to ignite a renewed appreciation for the world’s most beloved and worthwhile brands. Out of love for creation. Bart and Joris worked together on a social mobile games startup in the past. Back in 2013 they put their gaming hardware to work mining Bitcoin and Litecoin after office hours. They quickly figured out that coupling NFC technology with the blockchain could disrupt counterfeiters, and that this is a use case with the potential to put the blockchain into the hands of millions of people. Although their initial work was done back then, they knew the market was not ready yet. In 2017, they realized it was time to put their master plan to work, and so they did. Born as children of an artist whose work fell victim to counterfeiters more than once, Bart and Joris know first hand how devastating counterfeiting is to the lives of creatives. Seal is the best way for anyone to check if a product is genuine or fake. 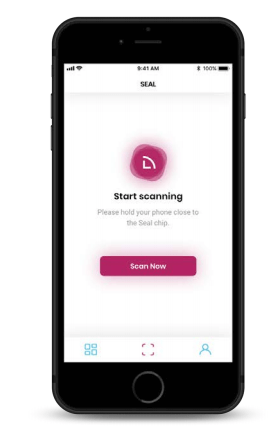 Seal combines NFC chips, which are embedded into physical products, the Seal app, and the Seal Network to provide a fast, simple, and secure way to provide products authenticity and other services. Seal lets brands earn money every time their products change owners. For the first time in history, brands can earn money from items sold through the secondhand trade, while simultaneously protecting their markets from counterfeiters. Using the power of the blockchain, authenticity can be checked and ownership can be transferred decades from now, even if the product itself is discontinued, as long as people contribute to the decentralized Seal network. Seal wants to bring back confidence to consumers and allow for brands to interact with their most heavily vested customers in the most direct way the internet has ever seen. Together, we build a better world in which consumers appreciate the creative work of makers and stop feeding the counterfeit economy.